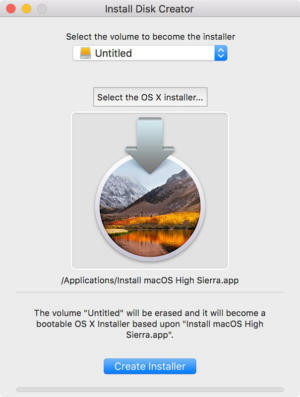 Put the macOS High Sierra installer on an external USB thumb drive or hard drive and use it to install the operating system on a Mac. 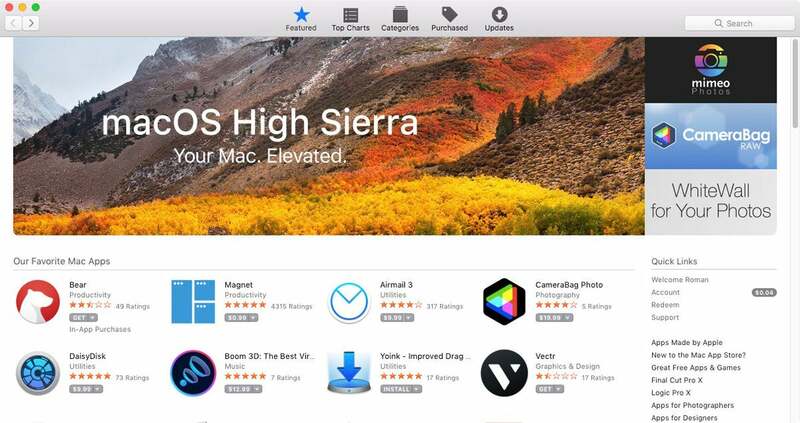 Apple distributes macOS High Sierra through the App Store. You need an internet connection, and the download will be over 5GB, so it’ll take a few minutes. For a single Mac, the installation process through the App Store works well, but if you have several Macs, it’s not efficient. That’s why I like to create a bootable installation drive. I can use the drive on each Mac I need to upgrade, saving me from the process of entering an Apple ID and password and then waiting for the download. It’s easy to create an external installation drive. It’s also handy to keep around, just in case you’re in a situation where you rather use the drive than rely on booting in Recovery mode. Here are a couple of different ways you can create a bootable macOS High Sierra installation drive. First, let’s cover the items you’ll need and how to get them. Then we’ll go over the two ways to make the drive itself. Just about any type of USB external drive will work: thumb drive, hard drive, or SSD. The installer software will take up over 5GB. If you want to use a thumb drive, an 8GB drive works perfectly. I used an 8GB Kingston Data Traveler G4 ($9 on Amazon); it’s cheap and it supports USB 3.1, so it’s fast. 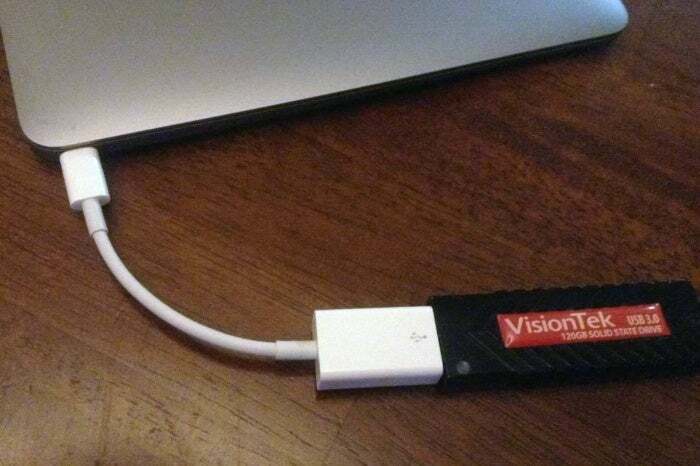 I’ve also used a VisionTek 120GB USB 3.0 Pocket Solid State Drive ($95 on Amazon) and older USB thumb drives that support USB 2, which is slower, but works. To connect a USB device with a type-A connector to a MacBook or MacBook Pro with USB-C, you need the USB to USB-C adatper. If you have a 2015 or newer MacBook or a 2016 or newer MacBook Pro, you may need Apple’s USB to USB-C adapter. This will allow you to connect a storage device that uses a USB type-A connector. If you have a USB-C storage device, then you don’t need to get the adapter. When creating the boot drive, the storage device is reformatted, so there’s no need to format the drive beforehand. Once the download is complete, the installer will launch automatically. But don’t continue with the installation. Instead, press Command-Q on your keyboard to quit the installer. The High Sierra installer app will be in your Applications folder, so you can go there and launch it later to upgrade your Mac to the new operating system. If you already installed High Sierra, you won’t find the installer app in your Applications folder. You also won’t find it in the App Store app under Purchased. Click here to go to the macOS High Sierra section of the App Store. This link should open the App Store app and take you directly to High Sierra. Under the High Sierra icon on the left of the banner, click on the Download button. This will download the installer to your Applications folder. If the installer auto launches, press Command-Q on your keyboard to quit the app. There’s a free app called Install Disk Creator that you can use to make the installation drive. It has been updated to support High Sierra. There’s another app called Diskmaker X that I’ve used before, but during the original writing of this article, it didn't support High Sierra. It now does. Download Install Disk Creator by clicking on the link above. When the download is done, you can move it over to your Applications folder. Then follow these steps to create your bootable macOS High Sierra drive. Connect your drive to your Mac. It’s OK if it’s not formatted as a Mac drive. The app will reformat it. In the main window, you’ll see a pop-up menu under “Select the volume to become the installer.” Click on the menu and select your drive. The main window of Install Disk Creator. Under the pop-up menu, you’ll see “Select the OS X installer.” (macOS used to be called OS X.) If you have only the High Sierra installer on your Mac, Install Disk Creator will automatically select it. If you have other macOS installers, you need to click on “Select the OS X installer” and select the High Sierra installer. When you’re ready, click “Create installer.” Your Mac may tell you that Install Disk Creator wants to make changes, and you need to enter your user name and password. After you do this, the app will take a few minutes to create the boot drive. You won’t see a progress bar. When the App is done, your installer is ready to use.